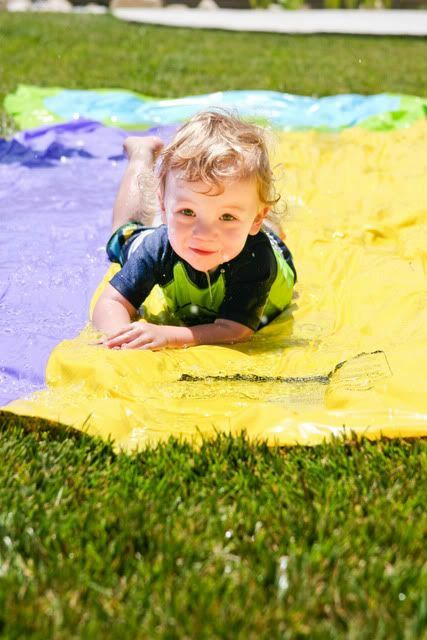 When I was younger I loved the slip and slide- so when I saw one in Target, well I just had to get one for my kids. We got it unrolled hooked it up, turned on the house and the water barely trickled out. We tried switching hoses, switching spickets... finally we just said forget it and laid the hose right on the slip-n-slide. I showed the kids how it was done- but they preferred sliding on their knees. Even Ryder got in on the action- he would run down the slide and then flop onto his belly at the end, over and over again laughing as he did it. The older two even got brave enough to slide on their bellies a few times. It was the perfect way to spend a hot summer day. Fun! I loved our slip and slide when I was younger too. We have one for the boys, but we haven't had it out to play with in awhile. Maybe on the next super hot day. How fun! 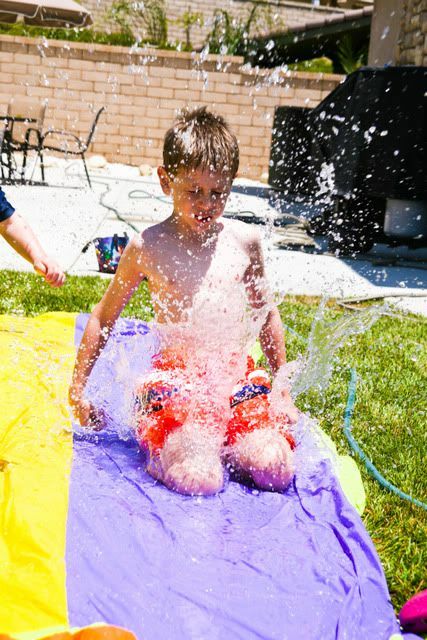 I couldn't get enough of the slip and slide when I was younger! 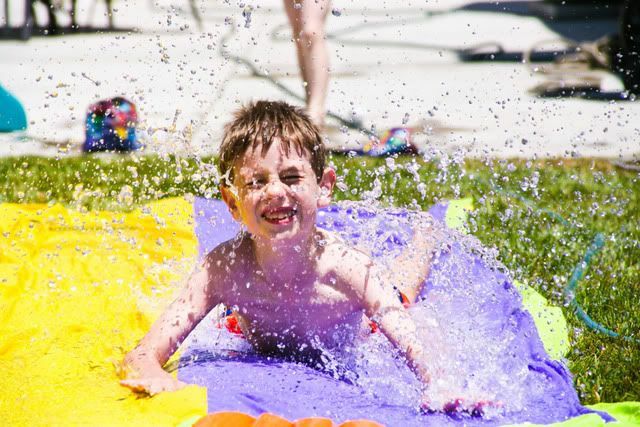 My kids love the slip and slide. Even my husband went on it with the kids. Great action pictures too :) Looks like your kids had a blast. Those pictures just scream SUMMER!! I was always too scared of it when I was little. 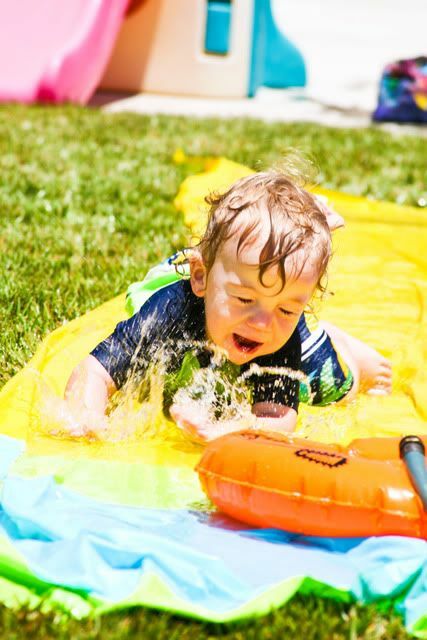 Those photos make the slip and slide look like so much fun! I bought a similar (Toy Story) one for my nephew that does all kinds of fancy things (squirts water from each side, down the middle, etc) and he LOVES it! I have never been on one, but think they should make an adult version just for that reason! Cute pictures! I wanted to get one of these last year, but never did. 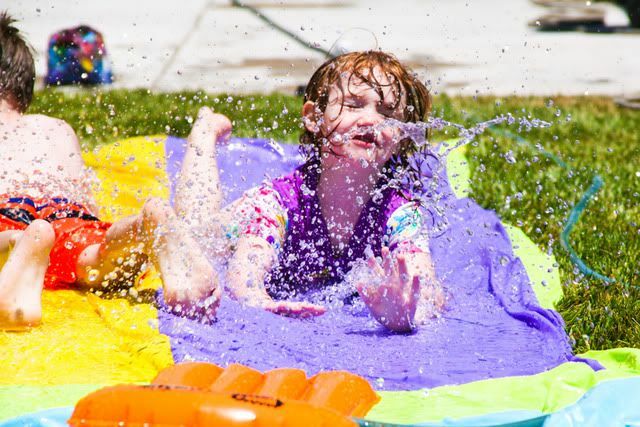 We went a couple times at a friends house and put the little outside plastic slide at the start with the hose going down that. That was fun too! Not only do you have movie making skills, your photography skills are simply amazing as well! Those pictures can't help but say, "Splish Splash, I was taking...wait not that one, How about, "Slip sliding away...."
How FUN!! Nothing like getting summer off to a GREAT start! Fantastic pictures! The kids look like they had so much fun :) I haven't been on a slip n slide in years.. I might have to look in to getting one now! 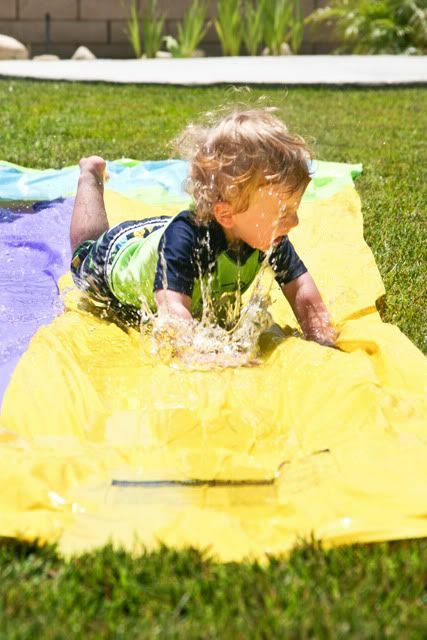 Nothing like a slip-n-slide! Great pictures! You're such a fun mom! I LOVED my slip n slide growing up!!! These pictures are incredible. You captured these moments perfectly. That is a perfect way to spend a summer day...I never had one but will definitely get one for my kids! Those things are fun when you're a kid!! I tried it as a teen...not so fun as OWEE! I LOOOOOOOOVE Slip n Slides. Too bad MacGyver always tries to make them "better," which often makes them complicated and less fun. Still, LOVE them. Some of the best summer memories for me were on one of those! So much fun! Glad your littlest is big enough to join in. I remember those! Summertime fun!! 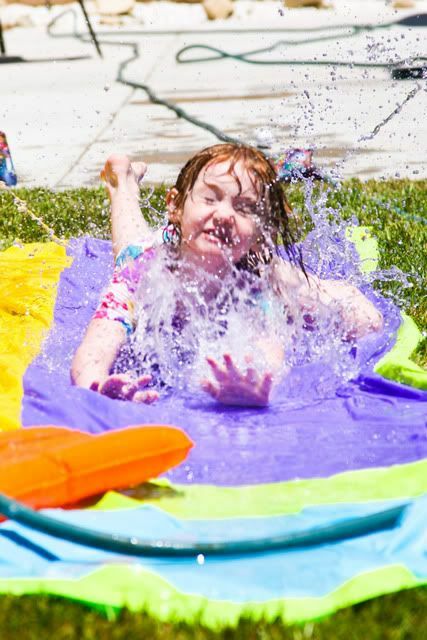 Perfect slipping and sliding summer photos! Love them all! Wow, great shots! Oh to be young again! PS. I'm curious, what setting did you have your camera on? I have the worst time capturing my kids in motion like that. How fun! I always wanted one of those, but my parents had an above ground pool so they told me no. That is awesome! We just got a new slip-n-slide today! We wore our other one out. My memory of the slip and slide and the reality of one were very different. It was much harder to get going and to use than I remember. And adults shouldn't try it … trust me. I have the bruises to prove it!